Looking for a St. Patrick's Day dessert idea? You will love these 15 St. Patrick's Day Dessert recipes! St. Patrick's Day is just under a week away, so I figured that it was the perfect time round up some delicious St. Patrick's Day dessert recipes. As someone who is crazy for mint, St. Patrick's Day desserts are some of my faves. Don't like mint? Don't worry – not all of the recipes in this round-up are minty! 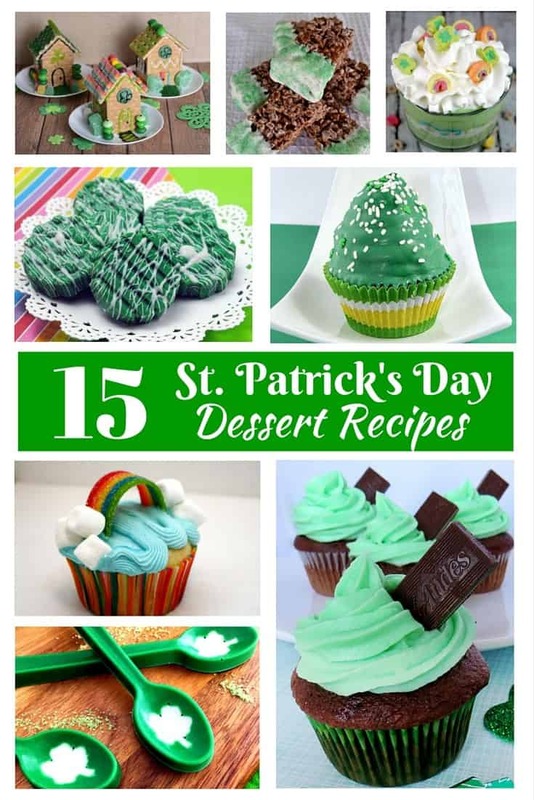 I hope that you enjoy these St. Patrick's Day dessert ideas and have a happy, safe, and delicious St. Patrick's Day! Every single one of these St. Patrick’s Day desserts look so delicious!! I’d especially love to try the Chocolate Mousse one. Thanks for making this great list! Great round up, you have a lot of good ideas here! I love all of your cute cupcake ideas!